Vermont and hip hop merge at Sarah Cover's new dance studio in Williston, Urban Dance Complex. Says Sarah, "I ... am trying to create a Vermont that I wish I had lived in when I was 13." In addition to hip hop steps, students learn what it means to be a dedicated and successful dancer. Some move on to NYC and LA and others remain in VT keeping the dream alive. Sarah Cover is a high-energy dancer and choreographer who moved back to VT after 8 years in NYC to share her love of hip hop with others. She travels regularly, keeping her style fresh and exposing the girls to well-known performers and cutting edge moves. 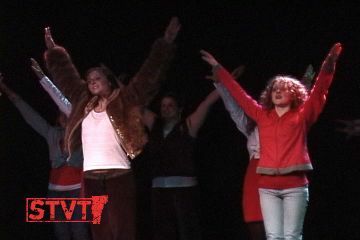 "Hard Knock Life" is a Broadway story told through hip hop dance, created and directed by Sarah and performed by VT Elements, a cast of 16 of her best dancers. "Annie" is played by naturally red-headed Mary Jo ("MJ") Cahilly-Bretzin, a 14 year old dancer who was recently signed with an agent after impressing Justin Timberlake's choreographers. "Sandy" is her "dawg" (friend) played by Lindsay ("Lu") Richardson. Lu is graduating high school and plans to move to LA in July. She began dancing with Sarah when she was 12 years old and hopes to have a career as a dancer touring with musicians like Janet Jackson. "Ms.Hannigan" is played by the expressive Ali Zura, a dancer who also teaches at UDC. After a brief stint in Canada, Ali is glad to be back in Vermont sharing hip hop with the masses and watching her friends mature and hone their skills. Talking to these girls about their craft is inspiring. They are young, talented, hard-working and they give Sarah props for pointing them in the right direction. She is a teacher, taskmaster, friend and mentor to them. It will be interesting to see what the future holds for these dancers as they embark into the world with the skills they learned here. Meanwhile, the Urban Dance Complex continues to bring hip hop to the Vermont masses, exposing a new batch of new students to an urban culture which is becoming more common in VT.
"Hard Knock Life" was shot at Higher Ground in South Burlington. Jeez, these vlogs just keep getting better and better. Every couple of weeks my wife and I pull up in front of the computer and lose ourselves in "Stuck in Vermont." The editing is so natural and flowing, that you don't even notice it. And the montages - my God - we have to invent a new word: montevatage. They're the best part. Keep 'em coming, Eva. I don't think there's a better 360-degree view of current Vermont culture anywhere in the Vermont media. I absolutely adore Sarah. Believe it or not I am a teenage girl living in Vermont, and I take classes at UDC. I LOVE it there. Sarah is the most amazing person, and is the center of my inspiration, and hope to do the same thing she did for all of her dancers. UDC is the best way to challenge yourself, and improve your dancing. Its never too easy in the right class, and you get to experience things that no other Dance studio in Vermont Can. She has the connections, to get all of the girls(and guys) that dance there off doing what we do best, Which is Dancing out in L.A.